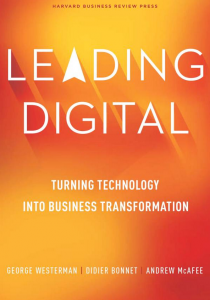 I have read about half of a recent book from George Westerman, Didier Bonnet, and Andrew McAfee – Leading Digital: Turning Technology into Business Transformation (2014). Their premise is that the innovations of the past decade have been nothing short of astonishing – yet they are just the warm up acts for what is to come. They suggest that those that master the digital playing field will be able to combine big data, machine learning, and visualizations such that their organizations will make smarter decisions, see the future more clearly, drive out inefficiencies, and better understand their customers. This book was published by Harvard Business Review Press…and is certainly geared towards business professionals. 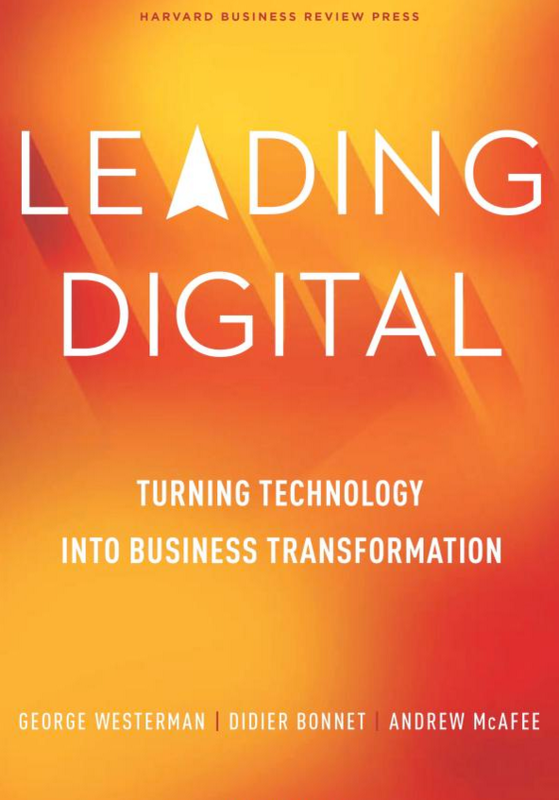 They note that the elements of the digital world – software, hardware, networks, and data – are “pervading the business world, and they’re doing so quickly, broadly, and deeply” (p. 5). The first half of the book focuses on two driving capabilities – digital capability (customer engagement, operational processes, and business models) and leadership capability (vision, governance, and infrastructure). Noteworthy (to me) is the absence of higher education. Yet, as I considered this, it struck me that it is more difficult to pin down any university (or college or department within universities). 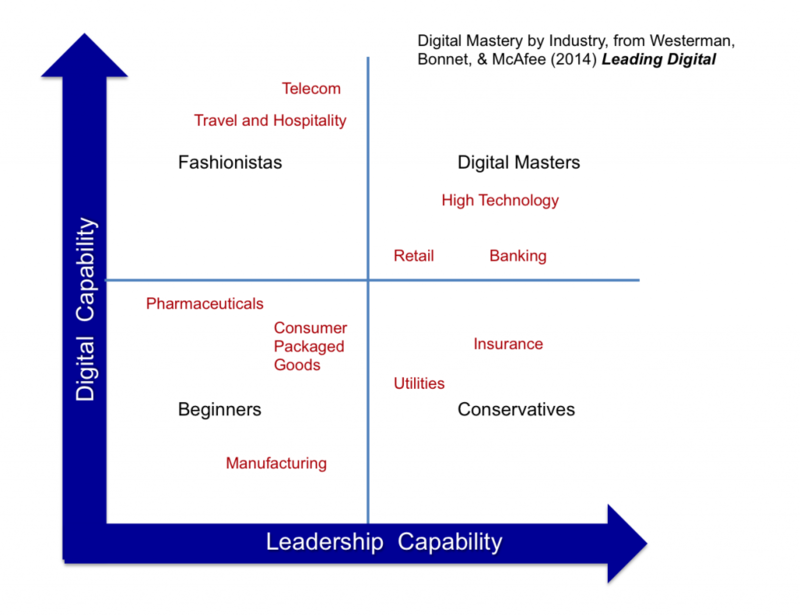 There are programs and faculty just beginning the digital journey. There are programs and departments that jump on bandwagons but do not have a compelling vision for where they are going. There are definitely conservative programs that are carefully considering their digital future. And there are higher education programs that seem to have successfully made the digital transformation, and there are numerous centers for teaching nationwide that focus on facilitating this digital transformation. We live in a networked world where the vast storehouse of human knowledge is literally accessible at our fingertips. There are unprecedented opportunities to create, share and interact on the web. We are witnessing the increased digitization of the university. If one agrees that these are true, one would naturally cultivate both the digital capability and leadership capability necessary to succeed in this digital world. Yet, the lack of urgency in developing these capabilities across much of higher education seems to suggest that some of our colleagues do not hold these as truths. 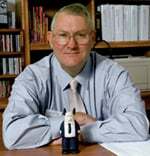 It brings to mind research conducted by Carol Dweck and others that has identified two distinct ways in which individuals view intelligence and learning. Individuals with a fixed mindset believe that their intelligence is simply an inborn trait—they have a certain amount, and that’s that. In contrast, individuals with a growth mindset believe that they can develop their intelligence over time. One wonders if faculty – many of who achieved success in a pre-digital era – are operating from a fixed mindset when it comes to digital literacy? It raises the question of whether one can focus on digital mastery without first tackling the issue of mindset? The second half of the book provides strategies for framing the digital challenges, investing in actionable ways, mobilizing and motivating workforces, and sustaining the transition. This book has me thinking … which is good. I would be interested in your thoughts around the digitization of the university – faculty and students – and the mindset associated with that transformation.